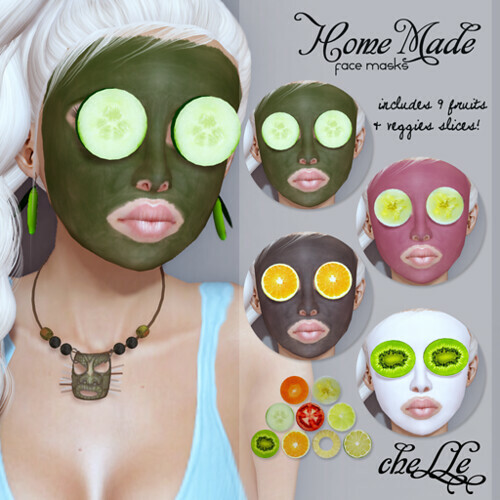 ✿ cheLLe ✿ has a new set of Home Made face masks that’s perfect for a girl’s night in (or guys)! This is my first attempt at painting a whole face, so I hope you guys like it and all the different mask flavors (Avocado, Berry, Chocolate, and Vanilla) and 9 different fruits and veggie slices are included. These are soo MmmmMmmm good, you’ll have to stop other people from wanting to lick your face! Lol damn, I love the texture. That is really nice. This is even better than what I had in mind. Great work Gogo! Oh and bath robes!!! Big snuggly looking terry cloth ones! OOh and Gogo, wheres that lovely necklace from? And is the face/mask/totem a sculpt or 2d image? Ohhh this is so old, I’m not sure it’s around anymore. It’s created by someone named Lilly Callisto, acquired in 2007. You could try sending her a notecard and asking her about it? It’s called (Juicy) Tiki Necklace.